Yesterday was Pi Day (3/14). We had a large number of students who recited a number of digits of pi. In third grade, Jackson Zehm learned the most with 31 digits; in fourth grade, Charlotte Abello with 41 digits; and in 5th, Alli Edgecomb with 22 digits. Our top two performers were both 6th graders. Anna Gosselin learned a staggering 240 digits of pi, and Abby Clark learned a mind-boggling 282 digits. 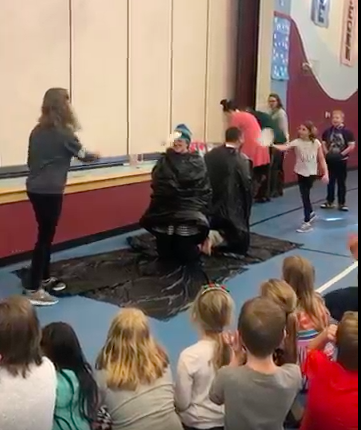 As a reward, they earned the honor of throwing pie at Mrs. Browne and Mr. Michaud. We hope you enjoy the pictures from today's event.